February is national cherry month! To start off a whole month of cherry filled recipes, I thought I'd start with some simple chocolate cherry chunk cupcakes, topped with a cool cherry cream cheese frosting. The pink tinted frosting from the cherry juice make them a perfect Valentine's Day treat! With an electric mixer, beat butter on medium speed until smooth and pale in color. Beat in cream cheese (make sure they are both at room temperature so you do not get lumps in your frosting). Add cherry juice and salt. Gradually beat in powdered sugar until incorporated. Beat on medium speed for about 3 minutes, until smooth and creamy. 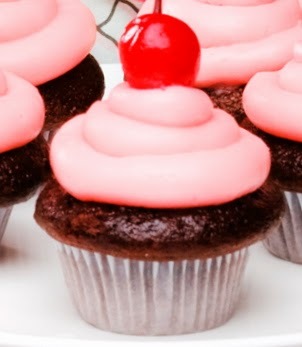 Top your cupcake with a pretty red cherry.